YarnHeart brings together stories and handmade hearts from across Australia to create a wonderful tactile, fun and colourful installation at the Bagot Community Festival, I HEART BAGOT on August 16 & 17, 2014. We want to connect your community to Bagot community through sharing a simple symbol of happiness and talking about the things we love in the places we live. We believe these simple acts can connect us, heart-to-heart, to our shared experiences as human beings. Crochet a heart, knit a heart, felt a heart, sew a heart together! Pop it in the mail and tell us what you’re grateful for in your community! 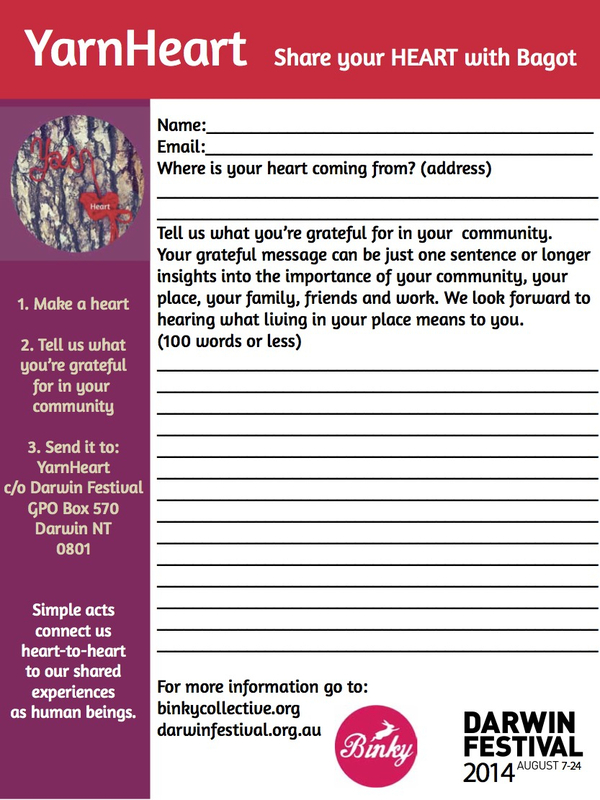 In exchange, you will receive a portrait from a Bagot Community member featuring your very own heart, with their personal grateful message. This portrait will be emailed back to you and your YarnHeart exchange will published online and the heart will feature as part of a wonderful I Heart Bagot installation at the Bagot Festival. Bagot community is located in the centre of Darwin, the capital of the Northern Territory and is Darwin’s oldest town camp. Founded in 1938, Bagot community was formed to take the place of the infamous Kahlin Compound for Aboriginal people in Darwin. Bagot is now home to around 300 Aboriginal people from around the Northern Territory – you can read more on the ABC. 1. Make us a heart. It can be knitted, crocheted, woven, felted, origami – whatever you like! Stuck for ideas? You can find inspiration here, here and here. 2. Tell us what you’re grateful for in your community. Submit your grateful message via the online form or print and complete the story sheet below and send it to us with your heart. Let us know what’s important in your community and why you’re grateful. It could be your neighbours, the local coffee, the good vibes. No rules, just gratitude! (And no more than 100 words please). 4. Like Binky and the Darwin Festival on Facebook or join our Grateful Project group. Sit back and wait to see your heart in Bagot!